Wang's Table is located on Merrimack Street in the center of Haverhill, MA. Proudly serving the community since 2006, the newly expanded Chinese and Japanese restaurant offers a modern look and relaxing atmosphere. Wang's Table focuses on using quality ingredients for their authentic cosine and has a full menu, as well as takeout. Stop in today and enjoy their excellent dinning experience for yourself today! GoingClear designed and developed the new Wang's Table website. Our main focuses for this project were keeping the overall look and feel contemporary, while also making sure to let the character of the restaurant shine through. We did have great photography for us to leverage, so that was a huge help! In terms of development, we added some nice features, like backend customizations that allow the client to update their menus on their own with ease. 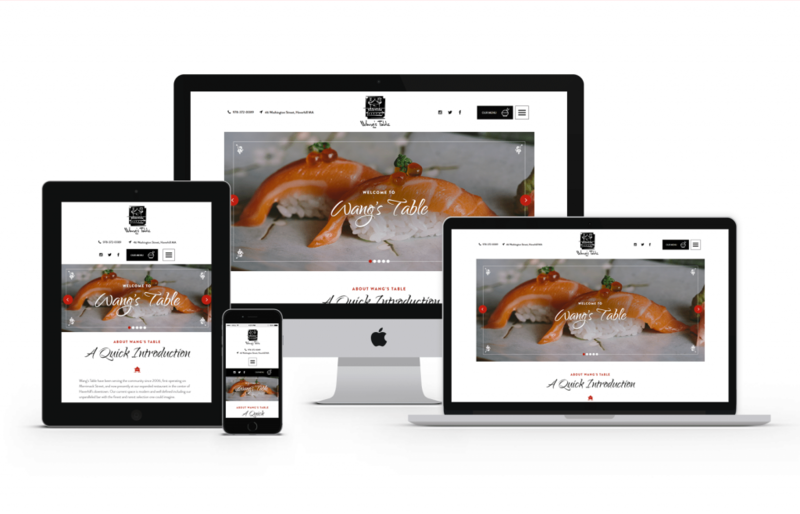 The new Wang's Table website was built using WordPress as the CMS - Content Management System along with a fully mobile and tablet friendly design leveraging Twitter Bootstrap for the responsive framework so visitors are guaranteed to have a flawless experience on any device. So please check out the website and be sure to stop in at Wang's yourself!